In Heinrich Hertz’s spark gap experiment (Figure 24.4), how will the induced sparks in Loop 2 compare to those created in Loop 1? Weaker, but how much depends on the tuner settings. 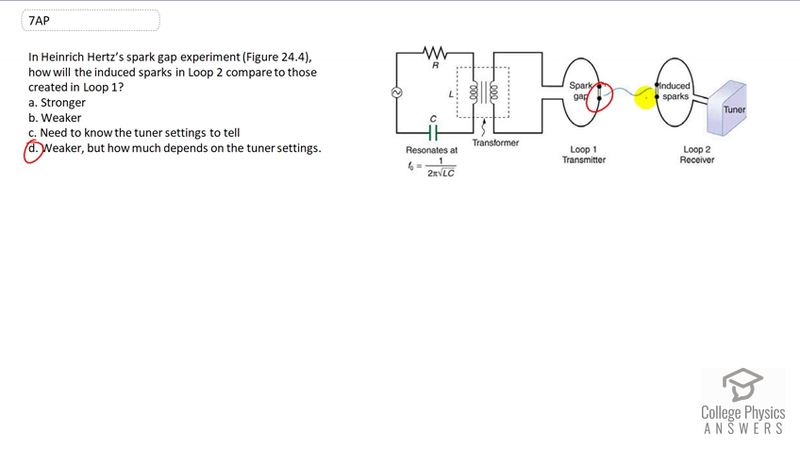 Figure 24.4 Heinrich Hertz's spark gap experiment. This is College Physics Answers with Shaun Dychko. The intensity of the electromagnetic wave produced by this spark gap here is going to reduce with distance. So the intensity is going to be whatever power is consumed here divided by the area of the sphere at whatever distance from the transmitter we are. So here is we can imagine that this is the radius of some sphere here and the total power emitted by the spark is going to be distributed over the entire surface area of that sphere. So the intensity is that power divided by that area. And so having a lower intensity here than was emitted means that the spark induced here will be weaker and so that gives us options B or D . Now how much weaker is affected by the circuit created by this tuner. This tuner has a variable capacitor probably, it could be variable inductor but I think it's more common to have a variable capacitor and they can tune the resonant frequency of the circuit because it has formula One over two Pie times square root LC. So if you can adjust C, you can adjust this resonant frequency. And so how much weaker depends on the tuner and so the best option here is D .